On May 21, after a trial that captivated the Arab world for nearly seven months, Egyptian multimillionaire Hisham Talaat Moustafa was sentenced to death for hiring a hitman to kill Lebanese singer Suzanne Tamim. The pop star, with whom Moustafa had been romantically involved, was found mutilated in her Dubai apartment last July. The dramatic sentencing, which spurred a scuffle between reporters and Moustafa’s relatives in a Cairo courtroom, capped one of the most sensational trials in Egypt’s history. The elements of the case were a tabloid’s dream and a government’s nightmare: a powerful lawmaker and real-estate mogul, a policeman-turned-hitman, scorned love, a $2 million murder contract and leaked photos of a beautiful star’s dead body. Though all death sentences must be reviewed by the country’s chief religious official, Egyptians are hailing the verdict as evidence that in a legal system often accused of iniquity, nobody is above the law. Moustafa’s attorney has vowed to appeal.  Born in Alexandria, Egypt in 1959 to Talaat Moustafa, a construction and real-estate magnate. By 2007, Moustafa, who had become chairman of his father’s business, had an estimated net worth of $800 million.  Won a seat in Egypt’s upper legislative house, the Shura Council, as a member of President Hosni Mubarak’s governing National Democratic Party in 2004. He is reportedly also close friends with Mubarak’s son, Gamal.  Appeared on Egyptian TV last August to deny rumors that he was involved in Tamim’s death, argue such gossip hurt the nation’s economy, and propose legislation making it a crime to spread rumors. His name was first linked with the homicide following the arrest of Mohsen al-Sukari, an ex-cop who had become a security guard at one of Moustafa’s hotels. Security footage, fingerprints and blood-soaked cloathes dumped outside Tamim’s building were later introduced as evidence of al-Sukari’s guilt.  Arrested and charged with murder on Sept. 2, after al-Sukari reportedly told police that Moustafa had paid him $2 million to kill Tamim, who had ended her relationship with the tycoon several months earlier. Egyptian authorities, meanwhile, refused to extradite the two men to the United Arab Emirates, where the murder occurred.  In November, the presiding judge banned publication of the case’s details other than procedural decisions and the final verdict. That same month, a defense lawyer for Moustafa confirmed to CNN that his client had been romantically involved with the singer, and that he had been unable to take Tamim as a second wife because his family had objected.  In March, prosecutors argued that Moustafa had acted as an accomplice to the crime by providing al-Sukari with money and entry visas to the United Arab Emirates and the United Kingdom, where he trailed Tamim, who had begun a relationship with an Iraqi-British kickboxer.  On May 21, Judge Muhammadi Qunsuwa announces the case will be referred to Grand Mufti Ali Gomaa, the nation’s highest religious official, who will rule on Moustafa’s death sentence on June 25. 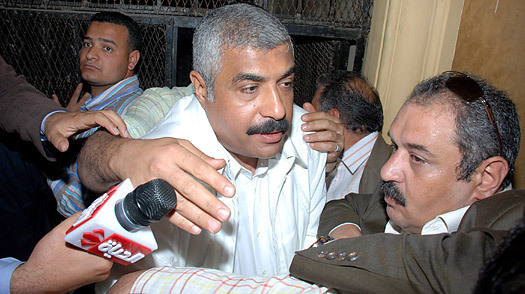 Upon hearing the verdict, Moustafa’s sister reportedly faints in the courtroom just a few feet from the cage where her brother stood imprisoned during the trial.